Mister Sam Shearon's Creepy Christmas (A Merry Macabre Coloring Book) | Nerd Much? With Halloween right around the corner, and the Christmas season beginning to be more prominently featured at your favorite retailer by the day, it’s clearly now time to start getting into the holiday spirit. Here at Nerd Much?, we obviously do things a bit differently, celebrating the nerdier side of the holidays with ridiculously cool, must-have Christmas items like a Batman Ugly Christmas sweater or these Fallout 4 Christmas Ornaments. This year, our first cool Christmas thing is Mister Sam Shearon’s Creepy Christmas (A Merry Macabre Coloring Book). Typically the holiday season is filled with jolly things like cheery elves, dancing gingerbread men, and annoyingly happy snowmen. But did you know that some of the best winter tales take a darker approach? 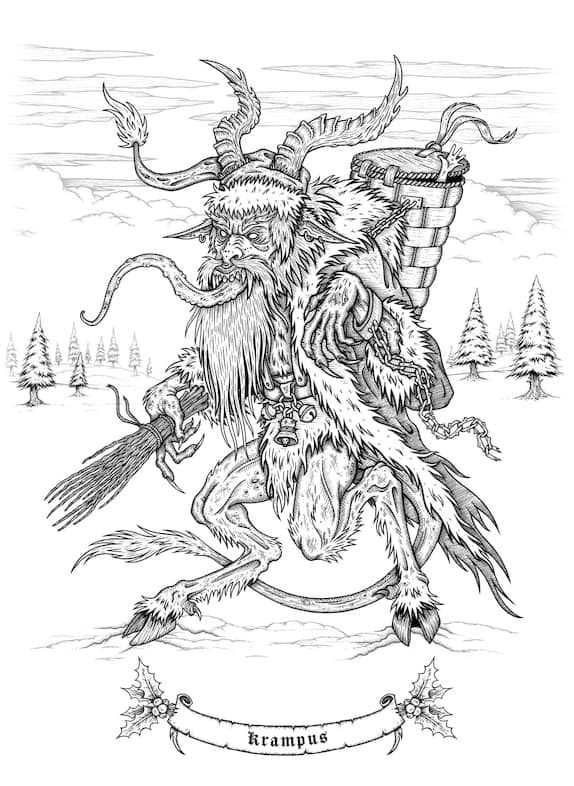 This creepy coloring book celebrates these sorts of holiday tales, as it’s filled with over 40 original hand-drawn and inked illustrations based on various traditional winter legends from around the world. The book includes such notable creepy characters as Krampus, Santa Claws, Rabid Rudolph, the Wendigo, the Yule Cat, and more — some of them you may have heard of, others you probably have not. These tales hail from various traditional beliefs from groups around the world, including British, Nordic, Icelandic, Austrian, German, and more folklore. Each page also features a poem written about that creepy character. It’s no surprise that Mister Sam Shearon’s Creepy Christmas (A Merry Macabre Coloring Book) is delightfully sinister in its design, given the fact that it’s created by Sam Shearon, who has had artwork in LA Weekly, Heavy Metal Magazine, and other mags, and he’s created album artwork for the likes of Rob Zombie, Fear Factory, Powerman 5000, and more. For more cool stuff to buy, stay tuned to Nerdmuch.com for daily finds. You can also follow us on Twitter for more cool things.